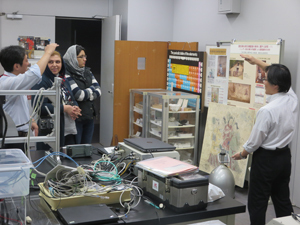 On October 30, two Iranian researchers toured the Institute to see how environmental management is conducted at Japanese museums for the protection of the items housed there. They visited Chemical Laboratory II and other sections, where they received a briefing from the persons in charge. 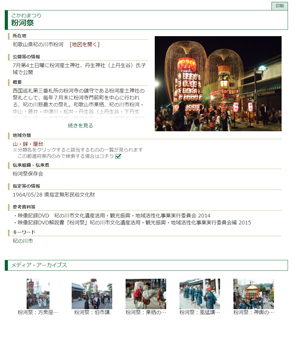 The International Research Centre for Intangible Cultural Heritage in the Asia-Pacific Region (IRCI), one of the Category 2 centres under the auspices of UNESCO, located in Sakai City, Osaka Prefecture has been conducting a research survey on disaster prevention for intangible cultural heritage in the Asia-Pacific region since 2016. 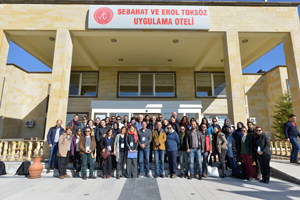 The Department of Intangible Cultural Heritage of this Institute has continually cooperated in its program. 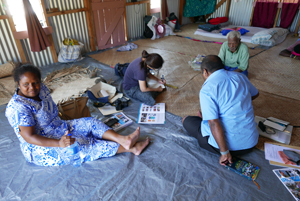 Mr. Tomo ISHIMURA, Head of the Audio-Visual Documentation Section of the Department, joined the on-site survey conducted by IRCI in Fiji as its collaborative researcher. Fiji is an island nation in the Pacific region. Many of its areas suffered tremendous damage due to a direct hit of Tropical Cyclone “Winston” in March 2016. This on-site survey was implemented in two villages with particularly serious damage in the eastern part of Viti Levu Island, where the capital is located. Interviews with local residents about intangible cultural heritage and disasters were made there. The hearing survey was conducted by four members from September 23 through October 3, 2017: Ms. Yoko NOJIMA, Associate Fellow from IRCI, Ms. Elizabeth EDWARDS from the Fiji Museum, Ms. Ilaitia Senikuraciri Loloma from the Ministry of iTaukei Affairs, and Mr. Ishimura from the Institute. 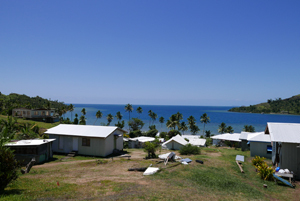 Although most buildings had been destroyed by the cyclone in both villages, houses were being reconstructed with the aid of the Fijian government and overseas NPOs. However, most of the new houses were built with lots of modern construction materials such as galvanized plates and concrete blocks. Regrettably, traditional-style wooden thatched houses called bures disappeared completely. Interviews with local residents disclosed the fact that much of their traditional knowledge was related to disaster prevention, including one heralding a cyclone. For example, they said that they had regarded trees bearing too much fruit as a warning sign of a cyclone. It was particularly true when a branch of the bread tree bore multiple fruits. In recent years, however, people have made light of such knowledge without utilizing it fully. The hearing survey also revealed the fact that the number of traditional bures had gradually decreased since the 1960s. Most of them disappeared due to the damage of Tropical Cyclone “Bebe” in 1972, and they were completely eradicated after the hit of Tropical Cyclone “Kina” in 1993. On the other hand, some people said that bures were optimum to ward off the heat and the cold and that it was comfortable to live there. They also said that there were few people who were capable of building bures these days. This on-site survey tells us that disasters change our traditional lifestyles and that intangible techniques are also apt to be lost accordingly. We understand that these tendencies are also greatly affected by globalization and modernization, not just resulting from disasters only. Based on these findings obtained through the on-site survey, we would like to seek the best way to maintain a good balance between “Reconstruction” and “Protection of Culture”. The Cultural Heritage Protection Cooperation Office of the Asia-Pacific Cultural Centre for UNESCO (ACCU) (Nara City) conducted the “Training Course on Cultural Heritage Protection in the Asia-Pacific Region 2017: Recording, Conservation and Utilization of Cultural Properties at Museums” from October 10 through November 3, 2017. The Department of Intangible Cultural Heritage of this Institute cooperated on this program by delivering a lecture titled “On-Site Seminar: How to Record Intangible Cultural Heritage” at the Institute on the afternoon of October 30, 2017. 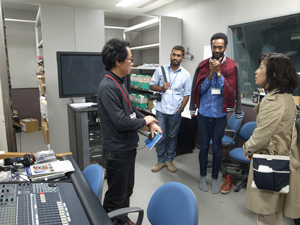 The lecturer was Mr. Tomo ISHIMURA, Head of the Audio-Visual Documentation Section of the Department. This seminar attracted six trainees from the Pacific region, who were experts engaged in practical affairs at museums (three from Fiji, two from Papua New Guinea, and one from the Solomon Islands). In the first half of the seminar, the Japanese system to protect intangible cultural properties was explained while in the last half, how to record intangible cultural heritage was presented concretely. 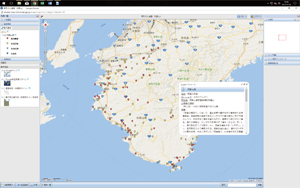 Particularly, focus was placed on image recording by using videos recorded actually by the Department (Kodan storytelling, a technique to make winnowing baskets from Japanese wisteria in the Kizumi area, and others recorded as videos) as visual aids. 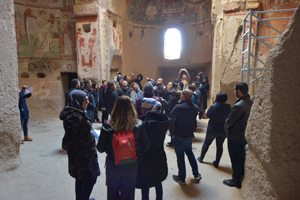 We realized that it would be meaningful to utilize the research outcomes accumulated by the Department for the protection of cultural heritage not only at home but also abroad.